Dr. Savy Ford graduated with honors from Life University in Atlanta, GA, where she received her Doctor of Chiropractic degree. She completed her undergraduate studies at Florida State University and received a Bachelor of Science degree in Business and Marketing. 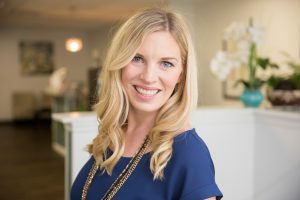 While pursuing her chiropractic studies, Dr. Savy focused her elective studies on pediatrics, pregnancy, and family care, with the goal of one-day promoting wellness for the entire family. That goal has germinated and ’blossomed’ into the creation of the Blossom Family Chiropractic practice. Dr. Savy is a native of the Tampa bay area, and grew up in Brandon, FL. While in her early 20’s, after suffering with debilitating migraines for years, she sought the help of a Chiropractor. After only a few weeks of chiropractic care, her migraines completely disappeared; that life altering change spurred her passion for chiropractic care and natural healing. Dr. Savy has received extensive advanced training in the management of infants, children, and pre-natal and postpartum women through the International Chiropractic Pediatric Association (ICPA). She is also certified in the Webster Intrauterine Constraint Technique and is working toward the completion of her Diplomate in Pediatrics and Pregnancy through the ICPA. In addition to managing her Chiropractic clinical practice, Dr. Savy is an established speaker, and presents wellness concepts through various networks, businesses, churches, and health and wellness events. 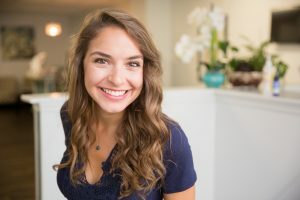 Her goal is to educate the St. Pete community about health topics so that residents develop a true understanding of how to live a happy and healthy life. Dr. Savy is passionate about serving moms, kids, and families in the St. Petersburg community. In her spare time, she loves spending quality time with her son, Chase, and her husband, Lucas. Dr. Savy and her family enjoy their time outdoors and traveling together. 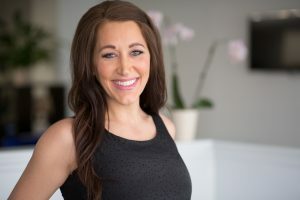 Dr. Dani completed her Bachelor of Science degree in Psychology at Purdue University and later attended National University of Health Sciences, where she obtained her Doctor of Chiropractic degree. Dr. Dani received extensive training in diet and nutrition, kinesiology, and sports management. She is certified in the Webster Intrauterine Constraint Technique and an ICPA member. She is also a certified Rock Tape (kinesiology tape) Practitioner, which is used to reduce muscle fatigue and promote blood flow in expecting mothers and athletes. Dr. Dani was first introduced to chiropractic medicine while still in high school, after a gymnastics injury left her with a severe spinal injury. During recovery, her passion for natural health was born. 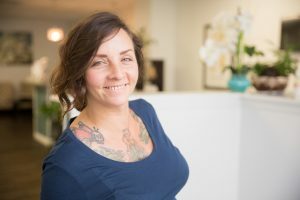 Dr. Dani found health, healing, and hope from her hometown chiropractor after allopathic medicine claimed surgery and pain medication were her only options. As a result of her personal experience so many years ago, Dr. Dani has dedicated herself and her career to improving the lives of others through chiropractic care. Her whole-body approach to health, healing, and wellness allows her to find the underlying cause of disease and greatly improve the health and quality of life of her patients. Dr. Dani is passionate about disease prevention, and encourages nutritional supplementation, dietary change, exercise, and lifestyle modifications to help nourish and energize the body, which is designed to heal itself. Prior to chiropractic school, Dr. Dani served in the United States Air Force, with a military specialty in patient care as a dental surgical technician. She headed the oral surgery department while stationed at Aviano Air Base in Italy, and also spent a year at Seymour Johnson Air Force Base in North Carolina. During Chiropractic school, her passion as a veteran led her to serve her country again, when she accepted an extensive apprenticeship at Bay Pines VA Hospital. Dr. Dani was born and raised in a small town in northwest Ohio — GO BUCKEYES! In her free time, she enjoys running, kayaking, yoga, and tries to take advantage of all that sunny St. Petersburg has to offer. Dr. Dani and her husband, Ryan love spending time with their daughter, Teagan and son, Grayson. Dr. Dani also loves photography, DIY projects, and embarking on many travels and adventures with her family and their chocolate lab, Bella. Tara Bassi is the Wellness Advisor and Office Manager at Blossom Family Chiropractic. She graduated from the Institute of Integrative Nutrition (IIN), where she received her Holistic Health Coach certification. Through her nutritional training, she has been educated on hundreds of dietary theories, and studied a variety of lifestyle practices. Tara strongly believes that the body has the ability to heal itself through whole foods, mindfulness, exercise, and chiropractic care. She holds a Bachelor of Science degree in Psychology and Mental Health. While pursuing her undergraduate studies, her elective studies were focused on Anatomy and Physiology, Public Health, and Women’s Health. Her passions include nutrition, women and infant health. She has many years of experience working with special needs children, and in the health and wellness field. She is also a certified Birth Doula. Tara is working towards completing her Master of Science degree in Nutrition and Herbal Medicine. Born in the big city of New York and grew up in a small town of Massachusetts, Tara moved to St. Petersburg, FL in 2014. She is an animal and nature enthusiast. In her spare time, Tara enjoys outdoor activities with her boyfriend, George and her dog, Gracie, cooking, yoga, traveling, and creating natural home-remedies. Follow @tarabassiwellness on Instagram for some food and health inspiration! Amanda is the massage therapist at Blossom Family Chiropractic. She has been a licensed massage therapist and graduate of The Massage Therapy Training Institute Kansas City, MO since August 2003. She practices a combination of therapeutic modalities to create a massage tailored to her clients’ specific needs. She combines deep tissue, myofascial release, trigger point, active release therapy, hot stone, and thai on the table massage. She also specializes in prenatal massage. Prenatal massage is beneficial for pain reduction, better sleep, decreasing stress hormones, reducing swelling, improving circulation, increasing flexibility, and sciatic pain relief. Amanda was born and raised just north of the Tampa Bay area in San Antonio, Florida. She lived in Kansas City, MO for 16 years, then moved to sunny St. Pete. In her free time, she enjoys spending time with her husband, John, their 6 year old son, Mark and newborn baby girl, Wren. In her spare time, Amanda enjoys anything outdoors, practicing yoga, going kayaking, and making people feel better. Gina is a new member of the Blossom team and will be working the front desk part-time. She has quiet a few tricks up her sleeve. Gina is a FL licensed Esthetician and a professional singer and actress. After receiving her Bachelor of Fine Arts degree in Music Theater, she moved to New York City to pursue her acting career. 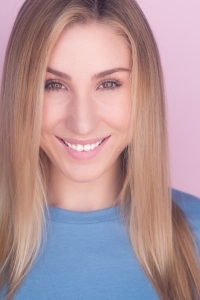 While in New York, outside of auditioning, Gina worked as a personal trainer at Equinox Fitness Club, where she took her passion for fitness to help others reach their goals. Gina loves to learn and be creative. Gina was born in Dunedin, FL, and lived in Connecticut and New York, and now resides in St. Pete. In her spare time, Gina likes to work out, go to the beach, write music, watch Netflix, and pet every dog she sees on the street.